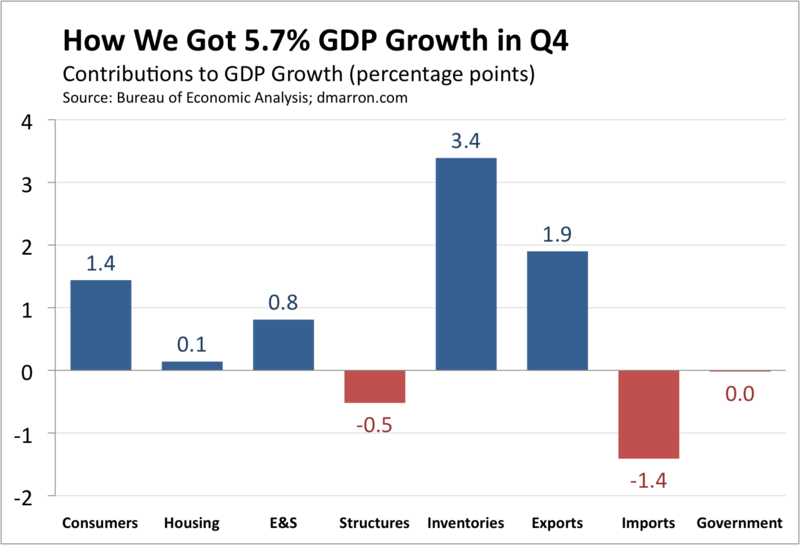 As expected, much of the growth reflects businesses restocking their shelves and warehouses: inventories accounted for 3.4 percentage points of the overall 5.7% of growth. Consumer spending grew at a moderate 2.0% pace and thus added 1.4 percentage points to overall growth (consumer spending accounts for about 70% of the economy and 70% x 2.0% = 1.4 %). That’s down from the previous quarter, when cash-for-clunkers boosted car purchases. Housing investment also slowed, again in the wake of earlier efforts–the tax credit for new home buyers–that had boosted growth in the third quarter. Business investment in equipment and software showed signs of life, growing at a 13% pace, the strongest since early 2006. That added 0.8 percentage points to growth, slightly more than half of which was offset by the ongoing decline in business investment in structures. Government spending fell slightly during the quarter. Stimulus efforts boosted non-defense spending by the federal government, but that increase was more than offset by a decline in defense spending and a small decline in state and local spending. slightly more than half of which was offset by the ongoing decline in business investment in structures. in eventaully getting married, having children, and creating a home with a man was during ‘the era of Studio 54’ in the late ’70s. This technique will also give you a little idea of what might be contributing to the jealousy you may feel as if no one will love you again. Now when you are hurt, bear it.